The Raving Queen: Another MGM-er Joins Her Fellow Contractees!!!!!!!!!!!!!!!!! Another MGM-er Joins Her Fellow Contractees!!!!!!!!!!!!!!!!! 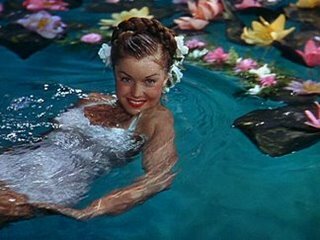 Girls, I just found out that, early this morning, MGM aquatic star Esther Williams, whom I just loved as Annette Kellerman in "Million Dollar Mermaid," has died at the age of 91!!!!!!!!!!!!!! Truthfully, I was not sure she was still alive! And, amazingly, even though, as a child, I wanted, for a time, to be a Weeki Wachee Mermaid in Florida, I never aspired to being Esther. Guess she was just beyond my reach!!!!!!!!!!!!!!!!! I can't recall the film, but that sequence, where she is surrounded by bathing beauties, all doing Busby Berkley routines in the water, and then she is lifted stories above, and then drops into the circle of lovelies, is what I first think of when I hear her name. Few looked so glorious in MGM's Technicolor of that era!!!!!!!!!!! She was no actress, but when she got into the water, something magical happened. And audiences loved it. As did yours truly, watching Esther's films on television!!!!!!!!!!!!!! And now Esther has left us. She will swim forever in the Great Beyond. Dive into your pools, this weekend, girls, as tribute!!!!!!!!!!!!!!!!!!!!!!!!!! !